The Little Magpie: Stop, colour time. Another coloured item?! Oh yeah, I know how to live life on the wild side. This jacket's from Boohoo's new Boutique collection which, if you ask me (you didn't, but I'm gonna tell you anyway), is the best one yet. There's a real boho-feel to it and all the items are pretty special, which made it hard to choose just one thing, but this jacket looked at me with puppy-dog eyes and said, 'Amy, you know deep down that I'm the prettiest thing here', so I said, 'Ok, welcome to my wardrobe/back new friend'. I don't like to boast about it but, yes, I am a clothes whisperer. I threw caution to the wind and fully embraced my colourful side by popping it on with this blue and yellow top from Sheinside. Admittedly I wore my black shoes so I didn't end up vomiting from monochrome-withdrawal. No one wants to see that. You suit colour so much wish I was brave enough to wear something like this!! LOVE the jacket and the necklace is gorgeous! wow! amazing colors & textures! oooh girl, that jacket is RAD!!! 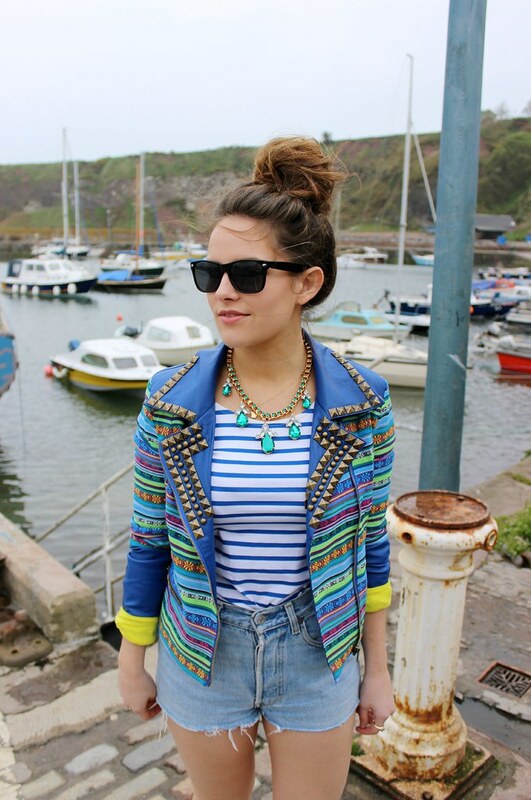 Ahmaaazing jacket, love the way you've styled it - necklace & stripes. Beautiful. Love the stripes and necklace. cool and amazing outfit again! :) i love the jacket. I adore that jacket, you've styled it so well. Love this outfit.